'Tis the season when markets are few and far between, and when farm stands tend to close at dusk, which comes earlier every day. That makes it tough to get farm-fresh vegetables with any frequency, except from the grocery. The good news is, autumn's harvest keeps for weeks, so you can stock up without fear of spoilage. 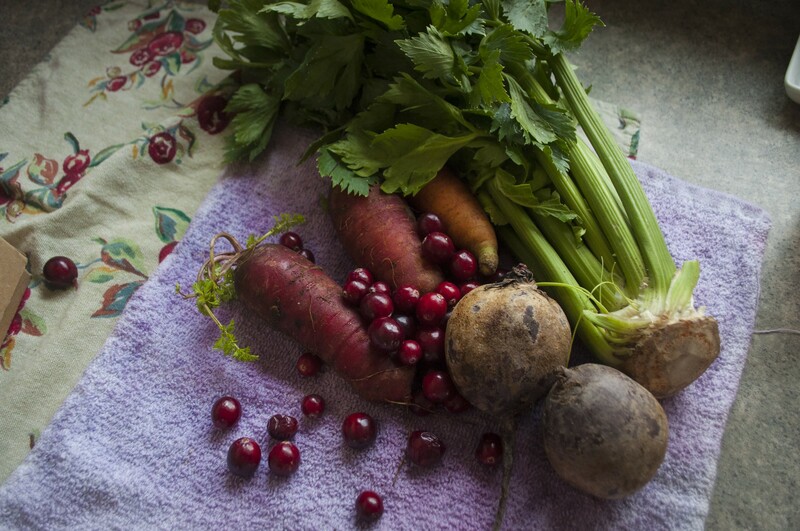 Right now, my crispers are stuffed with carrots from my last trip to mom's garden, beets from the Intervale's Half Pint Farm (from a weeks-ago trip to City Market), aging celery and a box of cranberries from Cranberry Bob. On the counter, my bowl of onions, garlic and shallots overfloweth. 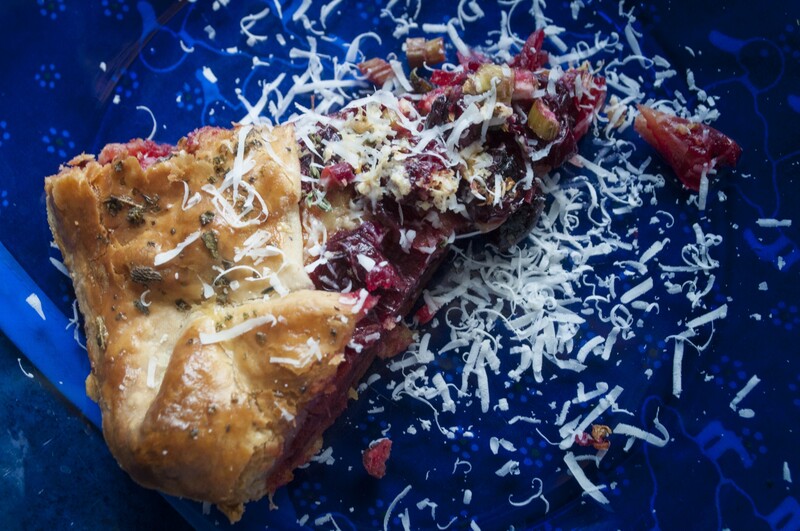 A while back, I made a bunch of pie crusts and froze a few for a lazy day when I wanted pie, and, wanting to do something fun with this assortment of cool-weather produce, I threw together a quick (and beautiful!) savory galette with some cheese. Like most of my farmers market recipes, this one is endlessly tweakable — mix and match the roots, swap shallots for onions or cheddar for pecorino (these will behave differently when baked but both will work), and voila! An impressive but easy supper awaits. Oh, the joys of freezing pie crust! Preheat oven to 375 degrees and place a rack toward the top of the oven. 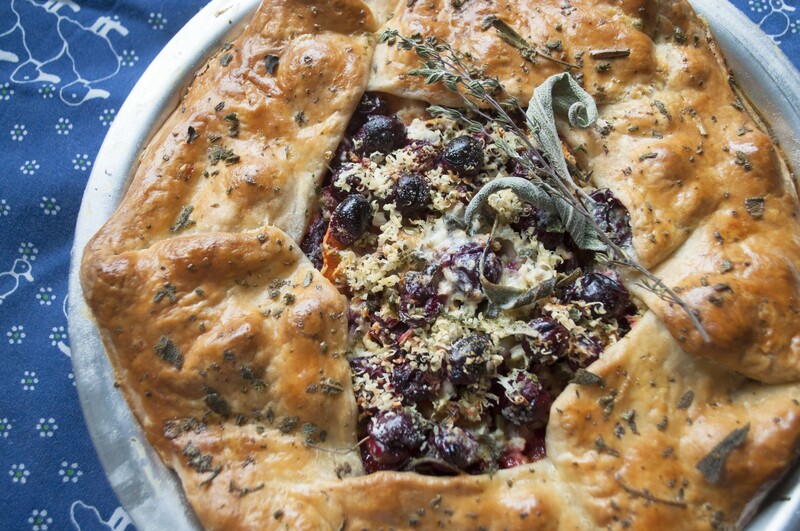 Place the pastry in a 9-inch pie tin; let the excess dough hang over the sides. Cover the bottom of the pastry with the grated Alpine cheese, making sure it's evenly distributed to the edges. Line the sloping outer edge of the crust with a layer of beets, forming a ring around the edge. Repeat with carrots, then beets again, alternating the veggies and working your way inward until you reach the middle. Slide the shallots in among the slices of carrots and beets. Sprinkle the cranberries, celery, and minced garlic over the top and season generously with salt. Place pats of butter on top of the vegetables and spread the grated pecorino over all. Fold the hanging edges of the crust toward the middle, forming a rustic pocket-pie. Beat the egg with the water and brush the top of the crust. Crush the herbs and sprinkle over the top. Bake for one hour, or until the crust is a deep golden brown, and serve warm, with or without clotted cream or a wet cheese such as burrata.